Neurofeedback is the Best Available First-Line Treatment for ADHD: What is the Evidence for this Claim? Attention Deficit/Hyperactivity Disorder (ADHD) is a chronic syndrome characterized by deficits in executive functions and attentional processes. Persons diagnosed with ADHD have significant deficits in self-regulation evidenced by difficulty staying focused, controlling impulsive behaviors, and for many, restraining hyperactive motor activity. These symptoms typically create problems in academic, social, and familial contexts as well as in the planning and organization skills needed for daily functioning. Additionally, comorbid syndromes that can mimic the symptoms of ADHD and confound differential diagnosis are commonly present (e.g., anxiety, depression, learning disorders). ADHD is the most frequently diagnosed pediatric disorder with 11% of American school-aged children (and nearly 20% of teenage boys) having been medically diagnosed with ADHD according to the latest report from the Centers for Disease Control (Schwarz & Cohen, 2013). Stimulant medication (SM) and behavior therapy (BT) are the two most widely accepted treatments for ADHD, with approximately 70% of those diagnosed prescribed medication (Schwarz, 2013). Although both interventions are considered to meet the highest standards for the evidence-based treatment of ADHD, and have been recognized as such by the American Academy of Child and Adolescent Psychiatry (AACAP) and Children and Adults with Attention-Deficit/Hyperactivity Disorder (CHADD), the leading ADHD advocacy group, the actual evidence is that these treatments fail to result in sustained benefit for the vast majority of children who receive them and, therefore, do not warrant being the first option for treating ADHD. The article reviews the evidence for making neurofeedback the first line treatment for ADHD. Cannon, R. L. (in press). Parietal foci for Attention Deficit/Hyperactivity Disorder: Targets for LORETA neurofeedback with outcomes. Biofeedback Magazine: Special issue on QEEG and Treatment Approaches for ADHD, June 2014.
deBeus, R. (2006). Progress in efficacy studies of EEG biofeedback for ADHD. Paper presented at the meeting of the American Psychiatric Association, Toronto, Canada. Fuchs, T., Birbaumer, N., Lutzenberger, W., Gruzelier, J. H., & Kaiser, J. (2003). Neurofeedback treatment for attention-deficit/hyperactivity disorder in children: A comparison with methylphenidate. 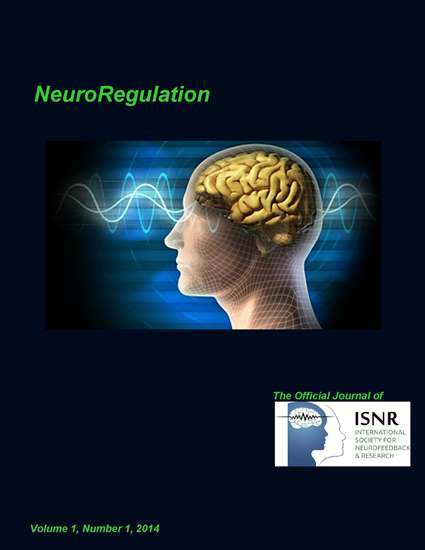 Applied Psychophysiology and Biofeedback, 28(1), 1–12. Gani, C., Birbaumer, N., & Strehl, U. (2008). Long term effects after feedback of slow cortical potentials and of theta-beta-amplitudes in children with attention-deficit/hyperactivity disorder (ADHD). International Journal of Bioelectromagnetism, 10(4), 209–232. Holtmann, M., Grasmann, D., Cionek-Szpak, E., Hager, V., Panzer, N., Beyer, A., & Stadler, C. (2009). Specific effects of neurofeedback on impulsivity in ADHD. Kindheit und Entwicklung, 18, 95–104. Monastra, V. J., Monastra, D. M., & George, S. (2002). The effects of stimulant therapy, EEG biofeedback, and parenting style on the primary symptoms of attention‐deficit/hyperactivity disorder. Applied Psychophysiology and Biofeedback, 27, 231–249. PracticeWise. (2012). Evidence-Based Child and Adolescent Psychosocial Interventions (see: http://www.aap.org/en-us/advocacy-and-policy/aap-health-initiatives/Mental-Health/Documents/CRPsychosocialinterventions.pdf). Riddle, M., Yershova, K., Lazzaretto, D., Paykina, N., Yenokyan, G., Greenhill, L., … Posner, K. (2013). The preschool attention-deficit/hyperactivity disorder treatment study (PATS) 6-year follow-up. Journal of the American Academy of Child & Adolescent Psychiatry, 52(3), 264–278.